Not to be confused with A Beam in the Dark. A Light in the Dark is the secret level of the third world in Yoshi's Island DS. It takes place in a complex castle lit by many torches. Black Yoshi starts the level near a staircase which the player must go up; then he can continue going right after getting to the top to find more stairs to go down. After that, Yoshi must then jump over a spike pit, collecting Red Coins along the way. Yoshi finds a room inhabited by four Piranha Plants and a flower. A chain is nearby which must then be traversed using Baby DK, he then finds a Middle Ring and then access Area 2. After entering Area 2, Yoshi has to use rubber balls to bounce to a higher area, then jump over a gap and use the Arrow Lift to get past some enemies. Once he gets past them, he can grab a key from the vase. Afterwards, Yoshi goes down a huge drop, and uses the Arrow Lift to continue again until he nears a door. The door leads back to the area he began in, and Yoshi must use the Stork Stop to continue, switching to Baby Mario. Yoshi must then jump into a narrow path, encountering a Middle Ring, a bunch of enemies, and spikes. At the end, Yoshi must break another vase to get another key. Yoshi must then jump across a long pit to get to a locked door. 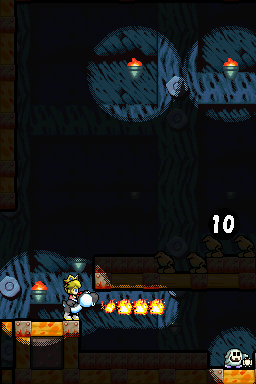 The player must then enter the door to access Area 3. At the beginning of Area 3 is a Middle Ring, as well as a hut for Yoshi to obtain skis. He then skis down the slope for a while until the end of the skiing area,after skiing Yoshi must jump over a few small ledges and platforms before making it to Area 4. At the beginning of Area 4 there is a Middle Ring and a few spikes to traverse, Yoshi has to dodge Crabbles along the way before reaching the goul roulette. Kurayami ni hio tomose! Light Fires in the Darkness! The level shares its German name with A Beam in the Dark from Super Mario 3D World. This page was last edited on April 22, 2019, at 15:38.